Started in 2014, the Engineering Learning Community serves as an opportunity for Engineering and pre-Engineering students at the Newark campus to build a social and academic network in their first year of enrollment at The Ohio State University. Students in the learning community take three common courses together during the first two semesters. Members of the learning community also have opportunities to interact with area engineers and employers throughout the year. Going to class with a group of freshmen who have the same academic interest and background. 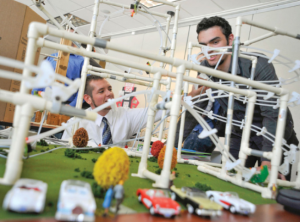 Courses you will take include Foundations of Engineering and Engineering University Survey class. Gaining the skills necessary to support your transition and your continued success on the Columbus campus. Joining other members of the learning community in meeting to provide feedback on your experience. Interacting with successful engineers in the local areas. Participating in field trips related to the field of engineering. Engaging in social activities designed for the learning community. *Receive priority consideration for Newark Campus Residence Hall housing for those why apply by April 1st (see the Housing page for more details). Take the OSU Math Placement Test and earn a placement level “M” or “L” (pre-calculus or calculus). Information regarding the test can be found under the Math Placement Test tab. While students are not obligated to accept our offer of admission or to pay the acceptance fee by April 1st, opportunities to be included in one of our learning communities do fill up quickly. We encourage you to pay your acceptance fee as soon as you know you want to join Buckeye Nation at Ohio State Newark. Application deadline has been extended to April 12th! Deadline to apply, April 1st is quickly approaching!